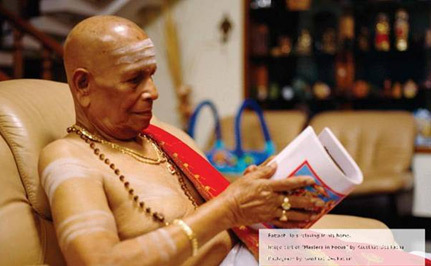 Sri K. Pattabhi Jois, affectionately called Guruji, dedicated his life to the teaching and study of Ashtanga Yoga. He was a Sanskrit scholar and vedic astrologer. At the age of 12 he found his teacher, Krishnamacharya (the grandfather of yoga, the teacher of the teachers), he studied with his teacher in the mornings before going to school, his family was not aware that he was doing this. This continued for 2 years. At 14 he left home with the equivalent of a few pennies in his pocket to study Sanskrit in Mysore at the Sanskrit college, at this same time his teacher left town as well. A year later Krishnamacharya came to Mysore to do a yoga demonstration, Pattabhi Jois went to see the yoga demonstration and recognizes his own teacher instantly! This began a 22 year teacher/student relationship of teaching and studying yoga at the Mysore Palace. One day while Pattabhi Jois and Krishnamacharya were giving a yoga demonstration a young girl in the audience spotted him, she remarked to her dad “that is the man I want to marry”. Her dad asked him to come to the house and interviewed him, as it turned out they were permitted to be married. Amma, as his beloved wife is affectionately known, was Guruji’s first yoga student and he taught her the asana all the way through the advanced series. Krishnamacharya was so impressed with her knowledge that he awarded her a teacher certificate as well. Amma was a big part of the yoga family and training, Nancy speaks of her often and how much she helped and fed the western students who came to Mysore to study yoga. Amma left her body in 1997, Guruji has missed her presence ever since. Life in the early years was a struggle for Guruji and Amma, Guruji was only earning 10 rupees a month teaching yoga at the Sanskrit college—barely adequate for a family of 5 (Guruji and Amma had three children, Saraswati, Manju, and Ramesh).. His students helped him build a house for his family to live in. It was not until 1964 that Guruji was able to add the yoga shala to the back of the house allowing students to come. The Europeans were the first to come, followed shortly there after in 1973 by Norman Allen, David Williams, and Nancy Gilgoff. This began the spread of Ashtanga Yoga around the world. Through the rough years there was never any question for Guruji. For over half a century he has taught yoga unstintingly, without any thought to fame or money. Although in recent years these things have come to him, it has not been in response to his pursuit of them. Instead he is a beautiful example of pure dedication. Somehow, by teaching what he himself learned from his own guru he has attracted people from all over the world to the door of his modest shala. Guruji served as a living example of what it genuinely takes to keep the light of an ancient tradition burning brightly. Om Vande Gurunam charanavinde, Thank you to Guruji, Sri K. Pattabhi Jois, who gave us this practice to remove poisons from our body and mind. I also want to extend my gratitude to my teacher, Nancy Gilgoff, who has devoted her life to teaching yoga as Guruji taught her, through her I am grateful that I learned to practice and teach Ashtanga Yoga as he taught her.